How to make kottayam style spicy mathi vattichathu at home? 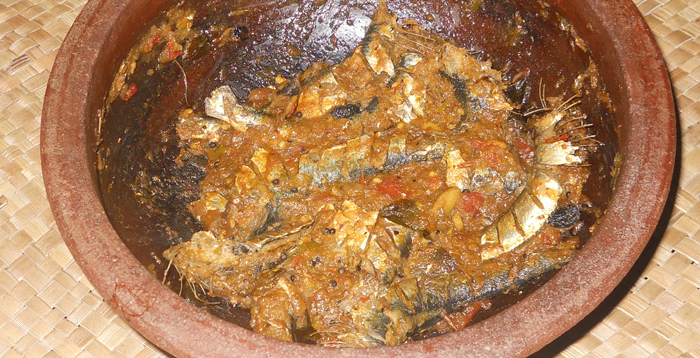 Mathi (Sardine) vattichathu is a traditional Kottayam fish curry. There is a saying in Kerala that, if you are trying any fish curry recipes from Kerala, then it should be from Kottayam. That’s true, Kottayam people cook the best fish curries especially when it comes to sardine recipes. Try this mathi vattichatu as a side dish with Kappa (Tapioca) / Appams and let me know your comments and suggestions. In addition to the rich Omega 3 fatty acids which can lower your LDL Cholesterol levels (will reduce heart diseases and is also good for your hair and skin) the small bones of Sardine fishes are rich source of calcium which is good for your bone and dentition. Clean and wash the sardines well and make oblique incisions over them. Mix and mash together the onions, garlic, ginger and keep them aside. Heat the clay pot and pour a little coconut oil into it. When the oil become hot, add the mustard seeds and wait till they start crackling. Add the curry leaves, mashed onions, ginger and garlic in to the heated pot and saute it well. When the onion becomes brownish, add the crushed chillies, tomatoes and turmeric powder to it and mix well. Add the water, vinegar / lime juice, salt, gambooge and allow it to boil. Add the sardines when it starts boiling. Keep it in the stove, until the sardines are cooked well and the gravy is reduced. Don’t forget to wash the gambooge, before using. Only a few of the fish vendors provides cleaned sardines because its a time consuming job. Also the strong stinky smell of sardine will remain in your cloth and hands even after washing multiple times. Better use an apron when you clean sardine and clean your hands with soap multiple times. Don’t forget to check out another exciting Kerala style sardine fish curry recipe. Have you tried our other fish curry recipes too? How to make Meen mulakittath Kottayam style spicy fish curry? This entry was added on April 1st, 2013 by Cini P Moideen in Non Veg and tagged with mathi meen curry, mathi vattichathu, sardine curry, meen, fish curry, sardine, mathi curry kerala, kottayam mathi, fish. Last revised on March 28th, 2018. @Pooja: thanks for trying. Please let us know the feedback.